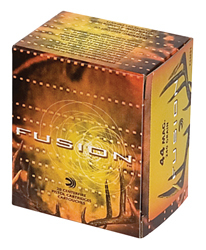 Fusion offers the most lethal ammunition in its class and it's now available for all disciplines of modern deer hunting: Rifle, MSR, shotgun slugs, handgun and muzzleloader. The most devastating deer bullet in its class carries all of its centerfire rifle attributes to its handgun ammunition. Each Fusion handgun round offers velocities, bullet weights and Fusion technology optimized for the short-range, maximum impact requirements of handgun deer hunters. It's now available for all firearm disciplines of modern hunting. Find your load here and discover the championship attitude that's been missing from your camp. Why Fusion is better? It has an inseparable jacket for high weight retention; It's pre-programmed for optimum expansion; It beats conventional bullets and is priced right; It's based on the latest in bullet technology; Tough; Accurate; Lethal.